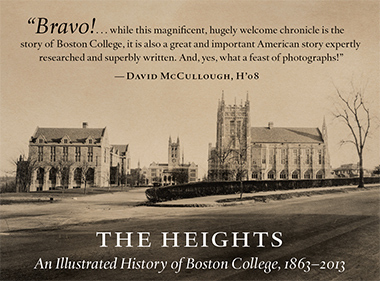 Beneath the domed, Romanesque ceiling and steel-railed balconies of the Boston Public Library’s rare books and print room, 12 students stood alongside a table on which lay a stack of 58 half-century-old prints. The skeletons, ghouls, and French society fat cats etched in black and white were familiar images to the group; the sheaf of thick-stocked paper formed the Miserere et Guerre (mercy and war) print series by the French artist Georges Rouault (pronounced “Roo-oh,” 1871–1958), and the students had already studied copies of the work in class. This was, however, the first time they had seen the originals. But the visit to the BPL that fall afternoon in September 2007 was about more than art appreciation. It was a shopping trip of sorts. In September 2008, Boston College’s McMullen Museum of Art will mount an exhibition devoted to Rouault (including Miserere et Guerre), and the “art museum class”—as their professors had come to call the group of students—was assigned to help shape it. Co-taught this year by history professor Stephen Schloesser, SJ, and Nancy Netzer, director of the McMullen Museum, “The Art Museum: History, Philosophy, and Practice” is offered annually and links two subjects: the history of museum exhibitions and the curating of a forthcoming McMullen show. For two hours each week, Netzer paired her art history lectures with Schloesser’s talks on Rouault. Field trips to the BPL, as well as to storage vaults in local museums, brought students face to face with original works not only by Rouault but also by his contemporaries, including a rack of Monet’s paintings that rolled out of a wall in a vault in the Museum of Fine Arts and left the students gawking. For 15 years, Netzer has taught a course tracing the evolution of museums from private or ecclesiastical collections during the classical period to public institutions today. In the last four years she has taught it alongside a faculty member who has been asked to curate a McMullen exhibition, with the aim of offering students a study of history and the experience of expressing that history through a particular show. “The idea was to harness students’ enthusiasm for primary-source research, which we’ve seen surface [among undergraduates] in spades,” says Netzer. “After they’ve become experts in the material, we take their ideas and suggestions seriously—what we should exhibit, how we should display it,” she says. At the same time, as the co-teachers work together, the curator comes to understand better the McMullen’s exhibition development process, says Netzer, and as the museum’s director, she can learn more about the curator’s vision for the show. This fall marked Netzer’s first collaboration with Schloesser, whose book, Jazz Age Catholicism (2005)—a study of how a generation of French Catholic artists and writers refashioned traditional religious imagery and language—inspired the upcoming exhibit, which is titled Mystic Masque: Semblance and Reality in Georges Rouault. Steeped in themes of sorrow, suffering, and redemption, Miserere et Guerre is widely viewed as his most significant work. Produced between 1916 and 1927, the series reflects the sense of disillusionment and devastation felt by the French at the conclusion of World War I, pairing pompous military figures, bourgeois stuffed shirts, and skeletons with classical and biblical quotes (“Man is a wolf to man,” from the third-century Roman playwright Plautus; “Out of the depths [have I cried unto thee, O Lord]” from Psalm 130:1). The work was immediately popular, and though Rouault’s reputation declined after his death, he was featured in several exhibitions during his lifetime, including major mid-century retrospectives at New York’s Museum of Modern Art and the Musee National d’Art Moderne in Paris. On their September visit to the Boston Public Library’s rare books and prints collection, the art museum class viewed works by many of Rouault’s predecessors, including prints by Honore Daumier and Francisco Goya. Rouault would have grown up with these left-leaning scenes of war, vice, and greed, Schloesser explained to the group. Netzer pointed out ink-saturation levels, margin widths, and ink bleeds at the tableaux borders. For history major Marina Hernandez ’08, who became interested in museum studies after an internship at the Laguna Art Museum, in California, last summer, the library visit was a chance to view significant artwork without the barrier of protective glass. “It was such a charge to see [Rouault’s prints] up so close with all the masterpieces that influenced them,” she said. Later on in the semester, she returned to the library to view the prints on her own, she said, for a paper she wrote about Goya and Rouault. Before the semester-long class concluded in December, each student had an opportunity to offer her (or in two cases, his) recommendations on what artworks to exhibit in the McMullen show, and how they should be displayed. “The idea is not just to select images, but to show [students] how to present them in a way that tells a story,” says Netzer, who will spend the next months working with Schloesser and the dozen or so Boston College faculty members who are writing essays for the exhibition’s catalogue. At semester’s end, she was considering ideas and works suggested by her students: influential Moreau sketches that she had never seen before; obscure works by Dix and Goya that clearly inspired Rouault’s social commentary.